Given the rapid pace of technological change and shifting consumer expectations, the retail store of today will likely look quite different five to 10 years from now. "The standard build-out of a retail space is all being re-imagined as each day goes by, with more innovative, energy saving and technologically advanced ideas," says Andrew Swedenborg, executive vice president of King Retail Solutions in Eugene, Ore.
Certain trends already taking shape provide clues about what the retail store might look like as we approach the year 2020. Here's a sneak peek at what will shape the store of the future. Decentralizing the store: The traditional retail layout and purchase experience are changing rapidly, as wireless technology allows customers to pay for merchandise anywhere in the store. "The Apple Store concept is changing the landscape of how we shop," says Kevin Horn, vice president at RTKL, a Baltimore-based global design firm. "There's no central cash register, and a sales associate can ring you up while you're looking at a product, which makes it a much more engaged experience." In addition, the receipt can be sent by email, while mobile apps like Square and Intuit allow you to pay using your smartphone instead of plastic. Buying an experience: As online purchasing becomes more popular, bricks-and-mortar stores will need to focus more on the experiential rather than the transactional. Because national brands are available in every city and on the Internet, the new stars will be local retailers that become a destination and offer a social experience. For example, instead of trying to get someone to simply buy a saucepan, offer a cooking class first and then promote the pan, Horn says. "There's a shift away from buying a product to buying an experience, or personal betterment and fulfillment." Ron Singler, a principal at Callison, a Seattle-based architecture and retail design firm, believes stores will offer multiple experiences to keep the customer engaged. For example, Terrain, a store started by Anthropologie, combines plants, a restaurant, books, furniture and more – all customized to the specific location. 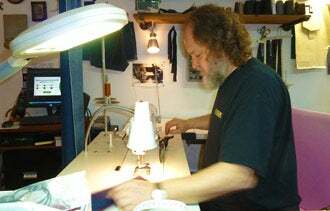 Vladimir Pisch, co-owner of Sweet Joey's, works on jeans that customers help design. Customizing the product: To enhance the shopping experience, more retailers are letting people participate in creating a product – whether it's a bicycle at Studio Velo in Mill Valley, Calif., jeans at Sweet Joey's in Asbury Park, N.J., or athletic shoes at certain Nike stores. "Many stores are becoming a little more like a workshop," says Piers Fawkes, founder and president of PSFK.com, a retail consulting company. "Whether it's 'make a bike with the experts' or 'make your own sneakers with the help of a sales associate,' it's about personalization." Letting the product promote itself: Swedenborg envisions more stores with wider aisles, open shelving and less clutter – with the product being the focal point. "I know that shelf space is at a premium, but what's your opportunity cost of having a constricted environment that makes getting out of the store as fast as possible preferable to staying there," he says. He cites the example of Whole Foods, which emphasizes the product itself rather than some design element. "In essence, the product is the décor element and is integral in the customer experience," he says. Reusing space: The days of retailers coming into neighborhoods and building new stores are waning, say Horn. Instead, they are opting to reuse existing space. For example, at Space 15 Twenty in Los Angeles, developers rented space in an old building to local stores and left a common area in the middle that alternates between a farmer's market, arts and crafts show and live music venue. "You have a built-in market of young, hip people who are going to appreciate this more than if they had torn it down and built something from the ground up," Horn says. On the opposite coast, Callison took the basement and first two floors of New York's Puck Building, refurbished the wood ceilings, chandeliers and rustic touches, and turned it into REI's flagship store. "The idea of taking the stuff already in this highly historic building and repurposing it has allowed REI to connect with its true customers, who tend to care about the environment," Singler said. "They're looking for an authentic experience, and in a subliminal way, using the history of the building lets them know the company values the authentic heritage of the brand." Corrections & Amplifications: An earlier version of this article misstated the name of a retail consulting company. The correct name is PSFK.